1994 Stratos 260F/S 1994 Stratos 260F/S ONE OWNER STRATOS Extremely Nice, Originally bought here, one owner Stratos fish/ski. Comes powered by a 90 h.p. Evinrude and equipped with: ski/rod locker, Evinrude Troll motor, stereo/mp3, cover, bimini, livewell, Eagle fish finder & more. 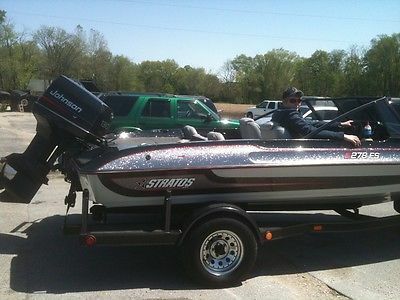 1995 Stratos 278V, 1995 STRATOS 278V with a Johnson 150 2 stroke. 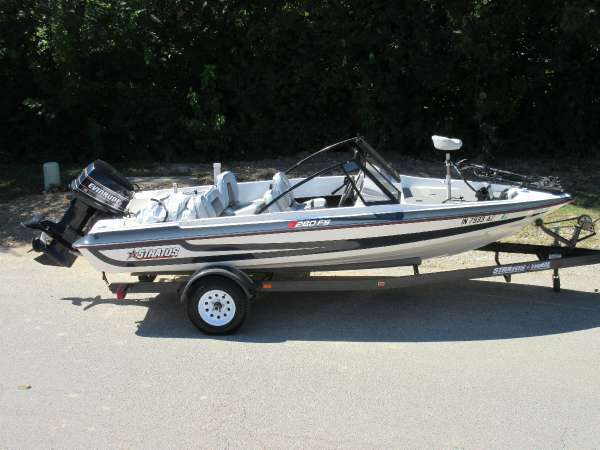 Includes a trailer, Motorguide trolling motor and boat cover. Boat is in great shape. 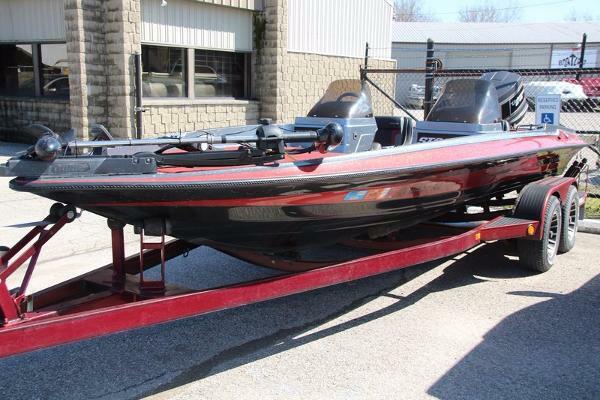 1989 Stratos 201DC If your in the market for a well taken care of pre-owned bass boat, then you need to stop and take a look at this very nice Stratos 201DC "Dual Console". While an older boat, she has been well kept and is ready to fish on into the future. Powered by a 150HP Johnson GT150 V-6 outboard. Package includes trailer, Motorguide Pro Series 24V 70lb Trolling Motor, Lowrance X135 Fish Finder at helm, Garmin Echo 150 Fish Finder at bow. 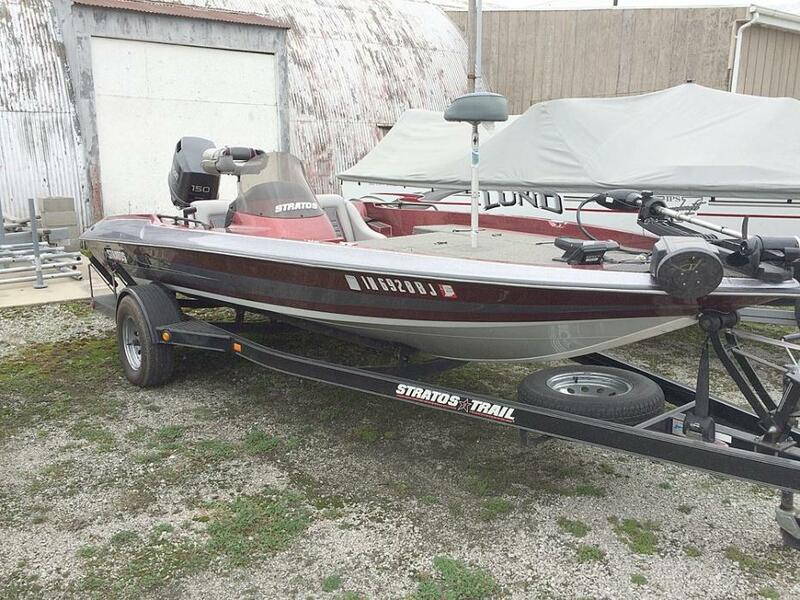 1999 Stratos 290 SF Intruder fish & ski 1999 Stratos 290 SF Intruder Fish & Ski (21’ X7’11”), ’99 Evinrude 200HP V6 Intruder FFI, ’99 Stratos Trail tandem axle welded tube custom with disc brakes, aluminum mag Wheels, tread plates, matching spare tire & carrier. 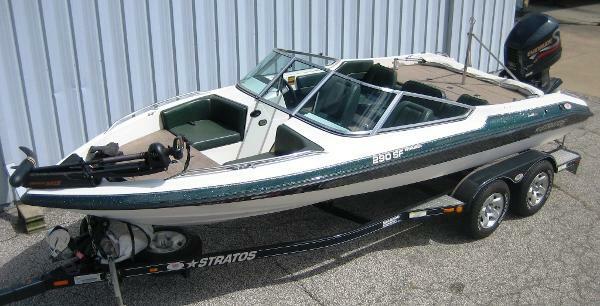 This boat is White with Green metalflake graphics. The Cockpit floor plan has (2) bucket seats with 3 across bench seats. The port & stbd seats lift out & become the Casting seats for the front & rear elevated decks. Helm features include hydraulic steering, L3500 in dash digital Depthfinder, 12V rec & instrument pkg. 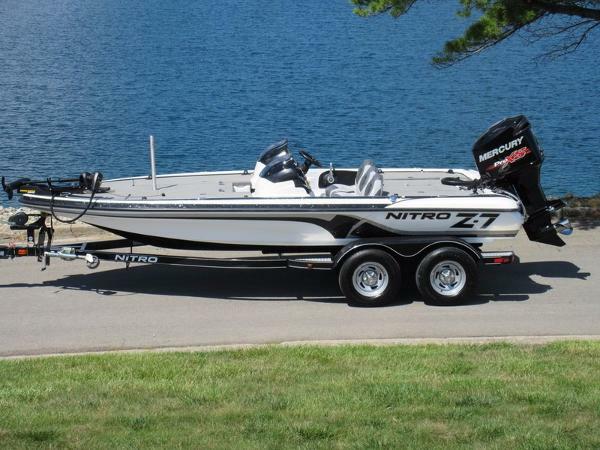 Fishing features include a 24V Minn Kota 65lb thrust bow mount foot Operated trolling motor, Lowrance & rod storage. Other features include a manual jack plate, SST Raker prop, SST ski tow pylon, battery On/Off switch, under floor ski storage, interior lights, glove box, curved glass Windshield, conv. Top & full custom fit road cover. Only 53.3 Hours total engine use (61.74 % at idle speed) Note: 1) Stereo is bad 2) Tach is intermitant.